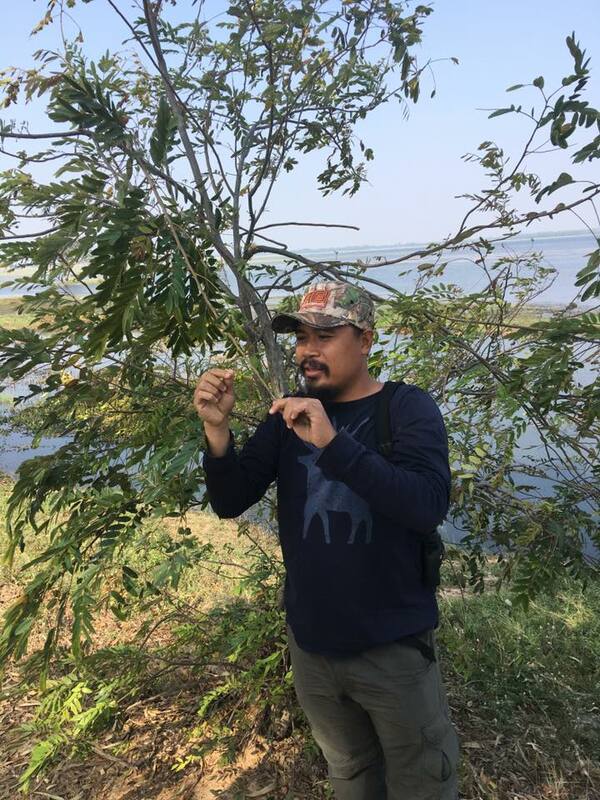 South East Asian Ecological Conservation (SEAECO) was formed as a non-profit corporation in the U.S. with the sole purpose of providing funding support for Foundation of Western Forest Complex Conservation (FWFCC). SEAECO is currently seeking private funding for an award-winning project organized and implemented by FWFCC. 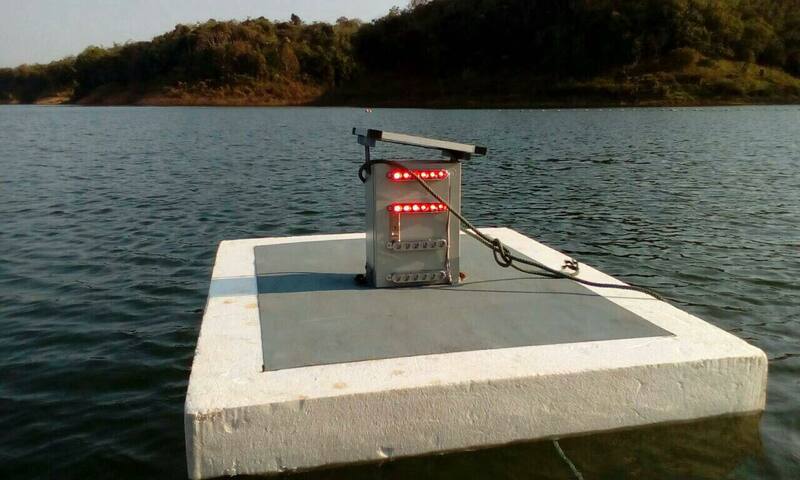 The Fishery Patrol Reinforcement Project enforces fishing net bans during the spawning season in Vajiralongkorn Reservoir, located in the Kanchanaburi Province, Thailand. 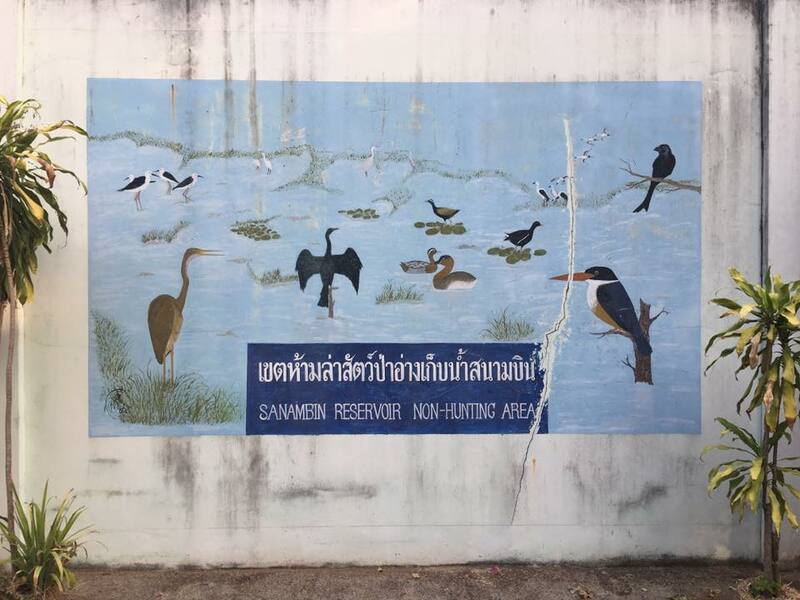 This project supports spawning of native freshwater fish including the endangered Wallagonia micropogon (Common Name: Black sheatfish, Thai: ปลาเค้าดำ). The local organization implementing the project is FWFCC. Tel & Fax 66 3468 5639. 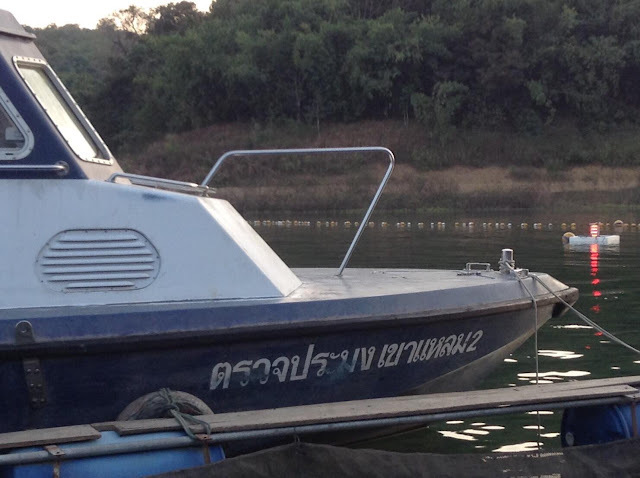 The Fishery Patrol Reinforcement Project was established in 2010 by FWFCC to support the Thai government in enforcing a fishing net ban in Vajiralongkorn Reservoir (formerly Khao Laem Reservoir), located within Khao Laem National Park. The primary goal of the project is to remove illegal fishing nets from the reservoir during the ban period (May 16 to September 15). This ban allows free movement of fish to their native spawning grounds up three main rivers that flow into the reservoir. Even though most are aware of the ban, the continued dropping of illegal fishing nets during the ban period prevents fish from reaching spawning grounds. In the long term, the lack of access to spawning grounds reduces fish populations and threatens the sustainability of this freshwater fishery. The fishing net ban is set to coincide with the spawning period for the majority of the fish in the reservoir. The fish species in Vajiralongkorn Reservoir include one of the nation's largest freshwater fish - the black sheatfish. The mating scene of this species has never been documented before but during the project operation 2016, one member of the Fishery Patrol recently documented the first recorded moment of the black sheatfish. Due to overfishing and illegal fishing, the population of the black sheatfish is gradually reducing nowadays. 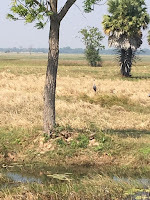 In addition to supporting spawning of several endangered fish species, the fishery in Vajiralongkorn Reservoir is an important food source for local communities (see Fishery and Aquaculture Country Profiles of Thailand by FAO). Even during the fishing net ban period, fishing is allowed by hook and line. Many reservoirs in southeast Asia are completely devoid of fish because of over-fishing and illegal fishing. FWFCC’s Fishery Patrol Reinforcement Project has substantially increased fish populations in Vajiralongkorn Reservoir. The project operation has recently been recognized among the public through the television programs on Channel 3 and channel 9 (Modern Nine TV-MCOT) that broadcasted nationwide and its network voluteers of the project had just received the renowned award this year(2016) which the award giving ceremony will be live-broadcast from the national culture center in Bangkok on december 17, 2016. Under pressure from the European Union, the Thai government overhauled its fishing regulations in 2015. The EU threatened a ban on imported Thai seafood and fish products unless reforms were enacted and enforced. However, enforcement of these new rules continues to be a problem. Sustained EU oversight will be necessary to make these new rules successful in preserving Thai fish resources and to protect Thai fisherman and industry workers. Reinforce the patrol tasks both onland and waterways of national parks, wildlfe sanctualries and fisheries units with all kinds of necessary and needed working resources, tools, equipments, supplies, etc. Support survey and monitoring projects which accumulate data on the status of forest resources, threats and wildlife. 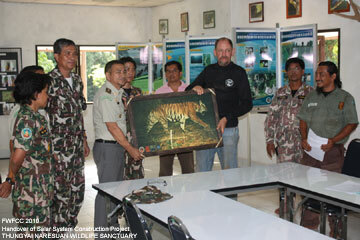 Support research and academic knowledge of Thailand's forests, waterways and wildlife traffickng. Disseminate knowledge, cultivate, educate and promote conservation of natural resources for the public. 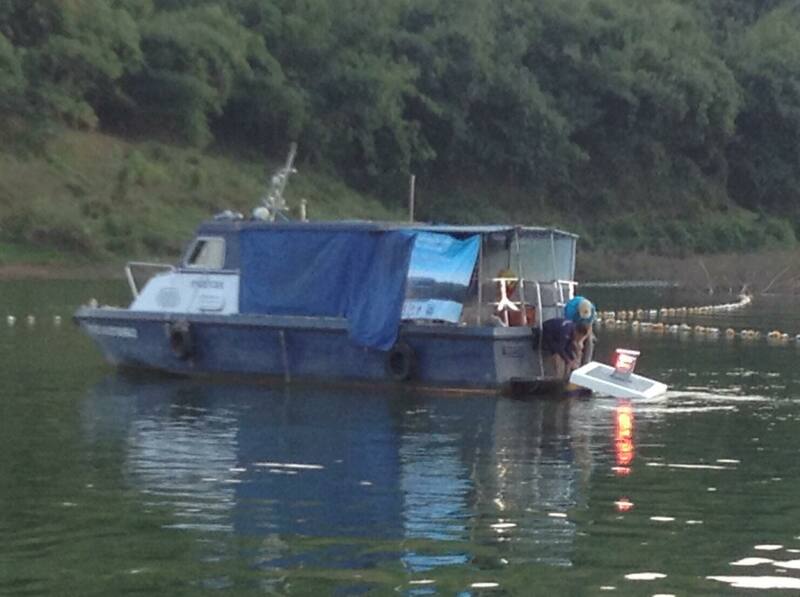 The fishery patrol reinforcement project has been on-going since 2010. The project aligns with FWFCC’s conservation approach to support and collaborate with government agencies in wildlife and fish management and enforcement. Specifically, FWFCC helps support budgets for patrol boats used during the project as well as organizes volunteer labor to support fishing net removal activities. Over the last seven spawning seasons, FWFCC and other volunteers have participated in hundreds of patrol missions that have helped remove and destroy thousands of kilograms of illegal nets. In 2016, the project won the prestigious Khon Khon Khon Award (People’s People Award: Thai's Green Heart. Thai:รางวัลคนค้นฅน อวอร์ด สาขารางวัลคนไทยหัวใจสีเขียว). The project was recognized for protecting spawning fish, coordinating with the Thai government agencies, and exceptional volunteer participation. In addition to the Fishery Patrol Reinforcement Project, FWFCC has several other on-going projects that have been recognized by the environmental community for significant conservation and scientific contributions. 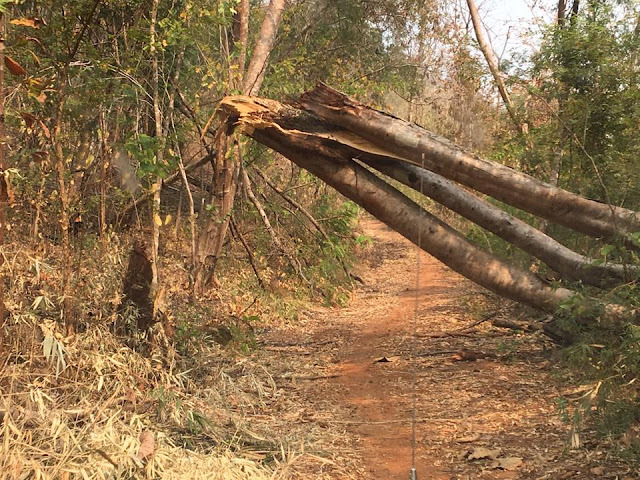 These include Huay Khayeng Wild Elephant Census Project, designed to resolve human/elephant conflicts that have resulted from forest fragmentation and development in the region. 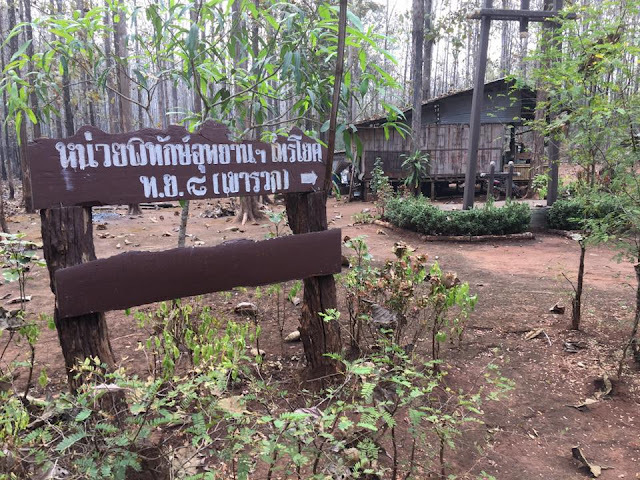 They also support Khao Nang Rum Wildlife Research Station’s Tiger Research on the endangered Indo-Chinese Tiger whose habitat includes Thung Yai Naresuan Wildlife Sanctuary. In support of on-going research in the wildlife sanctuary, FWFCC has also purchased, managed and installed power/communication systems as well as wildlife protection stations in key areas within the sanctuary. They also help provide provisions and equipment to government rangers and employees. 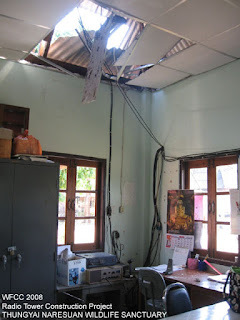 In addition to the FWFCC, several Thai volunteer organizations have participated in the project over the past 7 years. These include Bai Mai and the Spirit of Thai Social Volunteer Organization. 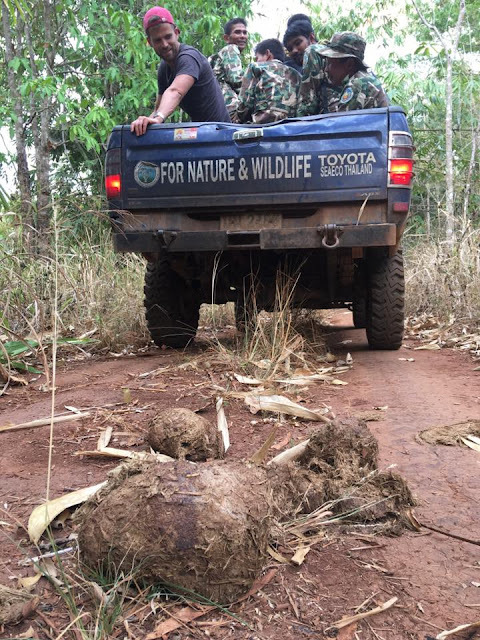 FWFCC also coordinates with the Thai Ministry of Natural Resources and Environment - Royal Forest Department on the patrol efforts and support. SEAECO and FWFCC have provided funding support for the project. A few days ago we learned that a villager (87 year old woman) had just been killed by a wild elephant in a nearby district. 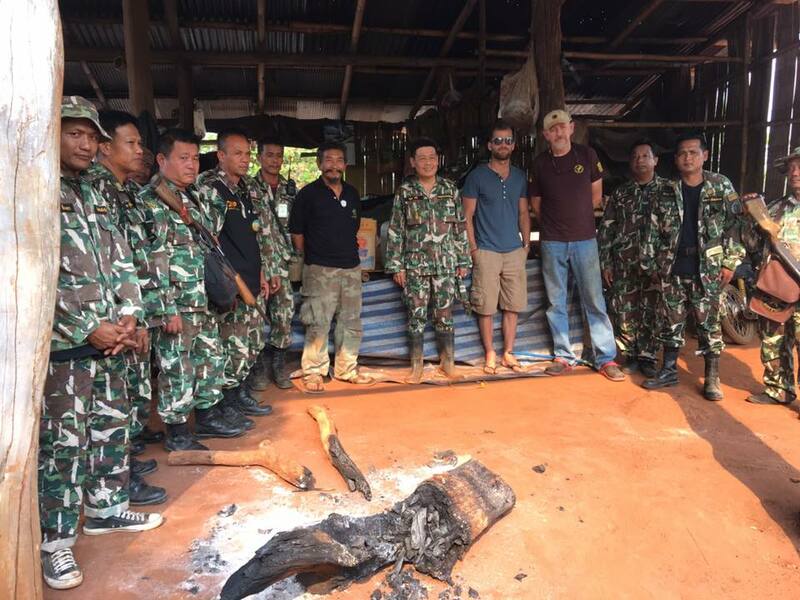 Because this concerns the Huay Kha Yeng Wild Elephant Herd in our local area, we wanted to assist Rangers at the Mai Yuk Ranger Station from Thong Pha Phum National Park. 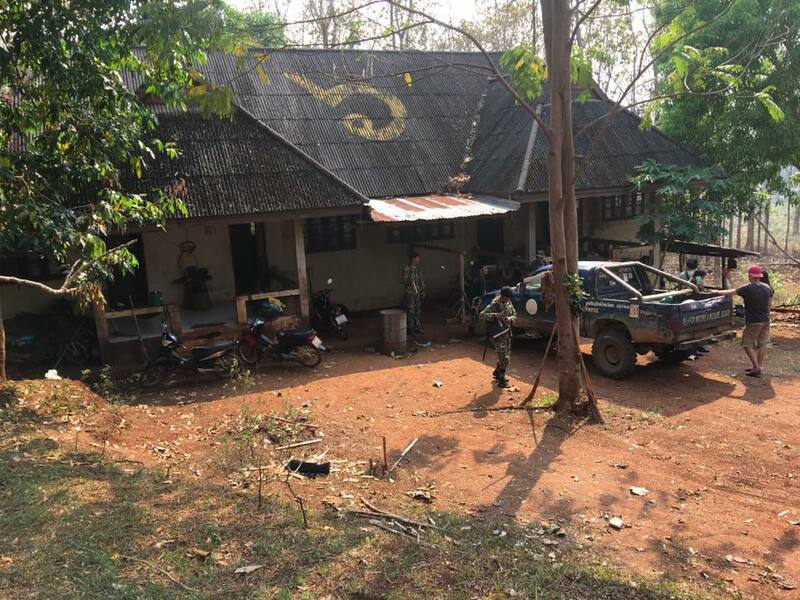 These rangers have been assigned to help secure the area for the local villagers where the elephants have gathered in search of food. 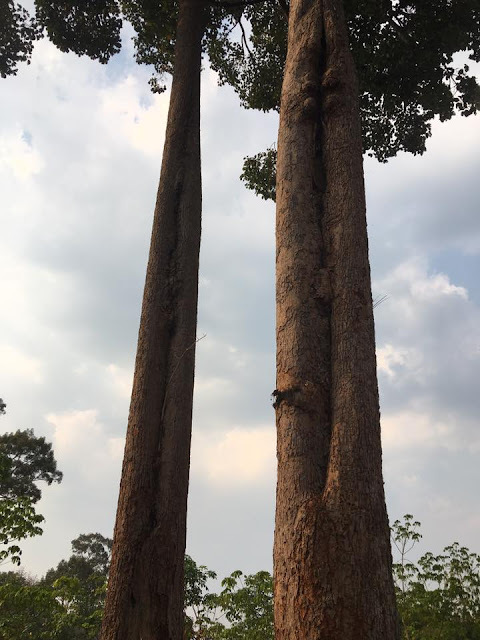 We will be driving through an area with thousands of teak trees. Known as a Plantation, its under control of the Thailand's Ministry of Natural Resources and Environment. 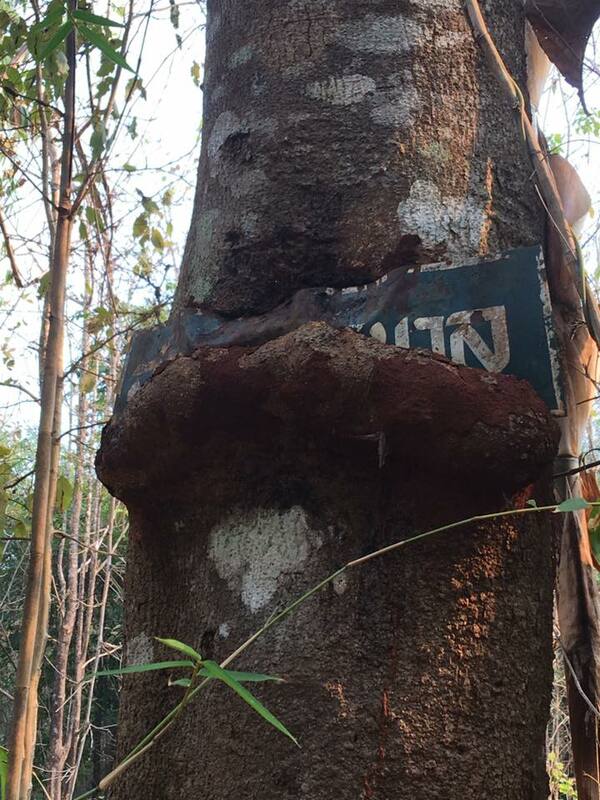 The trees are sustainably harvested (similar to BLM in the U.S.), as all other logging is outlawed in Thailand. The Station is located in a small area in the valley adjacent to the National Park and we've arrived to pick up the rangers. The area is closed to most travel after 4 pm because of Wild elephants are more active and begin roaming in the night. A an old sign at the summit of Khao Ruak being swallowed by the tree. Mai Yuk Ranger Station- Thong Pha Phum National Park — with Ádám Molnár. 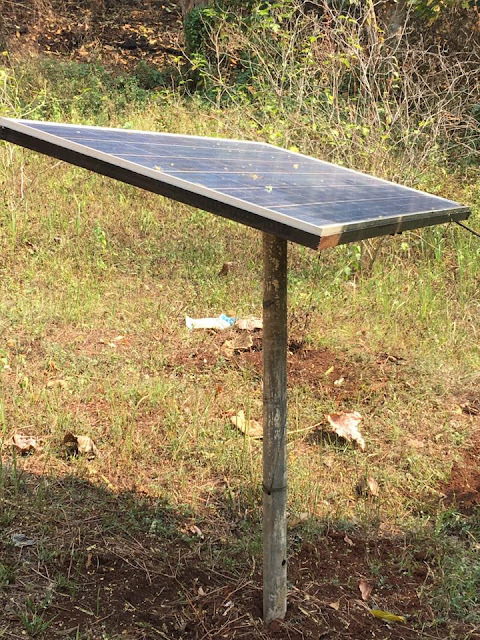 A small project that FWFCC and Seaeco had earlier initiated was the purchase and installation of a solar panel and batteries for Rangers at the Mai Yuk Station. Previously there had been no lights or way to charge cell phones. We've arrived near where the incident took place. 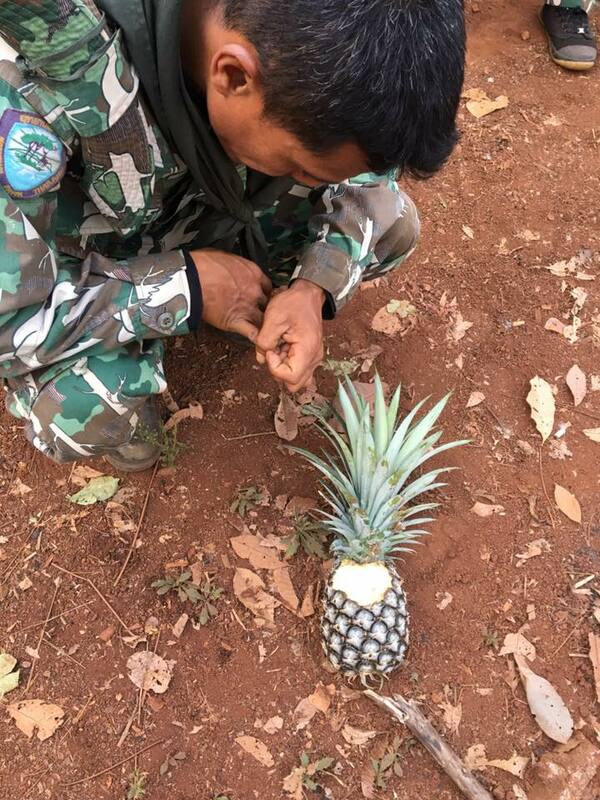 A few old growth trees from the old growth forest remain in local village farms, now mostly planted with pineapple and rubber trees. The incident occurred in the early evening. Several elephants were walking around and near the open style Karen bamboo house. The couple staying there were afraid and decided to make a run...it was a mistake. 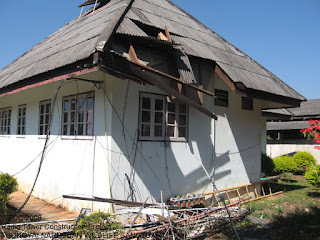 This photo was taken near the neighboring house where the elderly woman ran for safety. She was met by a mother elephant and baby, the mother, in defense, gave a swift and powerful kick. 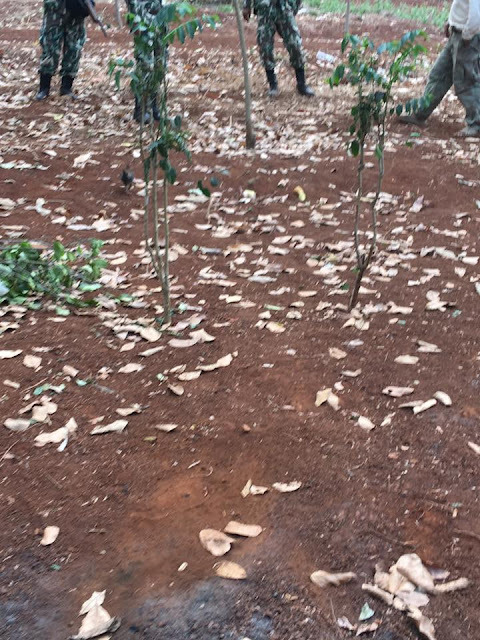 In the foreground you'll notice a light area of soil where the mother elephant placed her powerful kick, ending the woman's life. Our trusty truck-Moonliner winds its way up the Khao Ruak Road, a steep, rocky, treacherous, rutted and dry road. It becomes a nightmare if it rains. Signs of elephants...yep one big dung pile. — with Ádám Molnár. Several kilometers into the forest, we've stopped at the Khao Ruak Ranger Station and delivered drinking water. 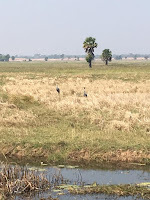 During the dry season, water is difficult to find. My good friend Ádám Molnár had recently arrived from Hungary. — with Ádám Molnár. 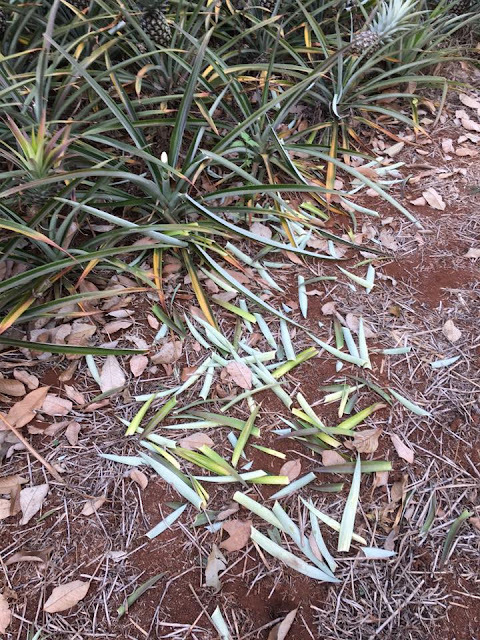 One bite at the stem and the pineapple is free and the leaves removed. It's going to be a bigger problem next year as the elephants will return..."memory of an elephant" is real and next year they will eat the entire crop. So, what to do? Likely the best solution is to change the crop, but being used to doing things a certain way, makes it more difficult to change people's views, ideas and ways. 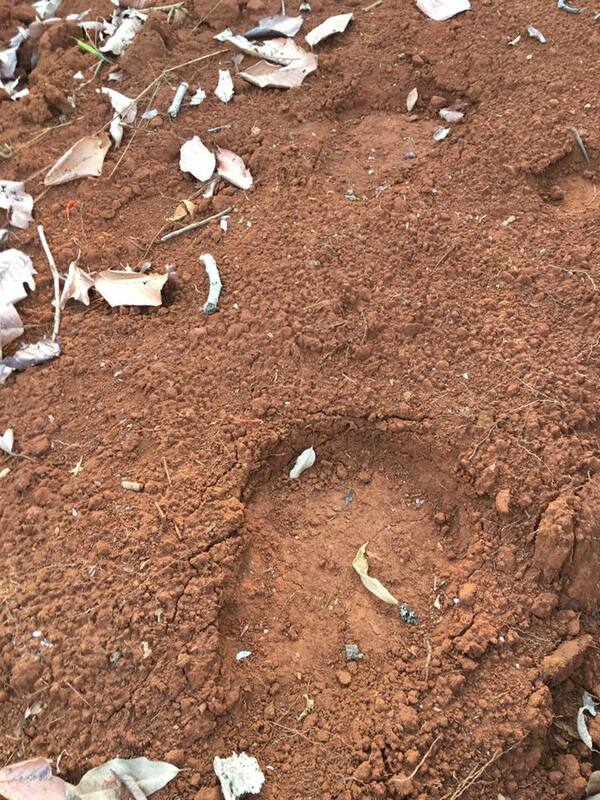 Fresh elephant tracks...likely from last night. 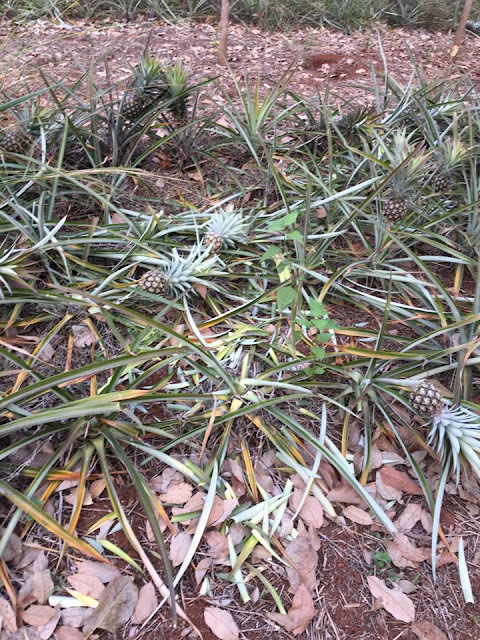 Pineapples here were just harvested, so the tracks are easy to see in newly turned soil. 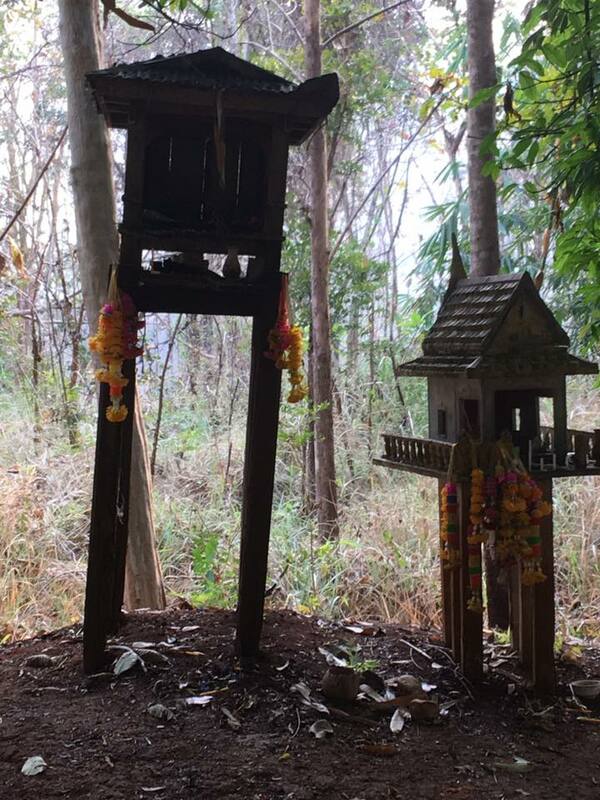 On the top of the mountain, the Khao Ruak Forest Protection Shrine, we stop and pay respect. It's the dry season and the elephants are looking for two things...over 200 liters of water per day per full grown elephant and of course food. 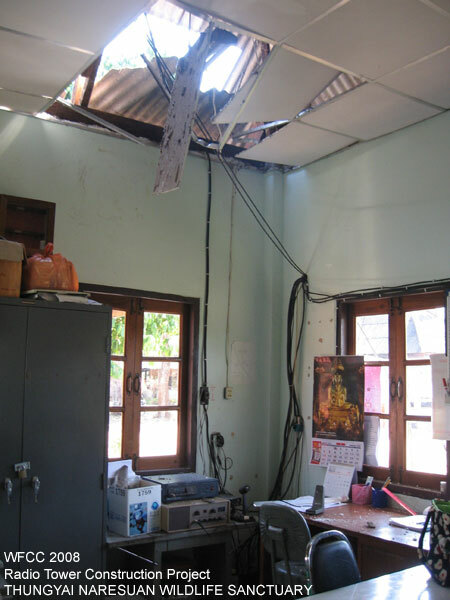 Many cisterns in the neighboring rubber plantations are destroyed in their search for water. Ultimately, this crop of pineapples is tasty and perfect for them. Already they have trampled some of the plants and have begun eating. No doubt they'll be back tonight. We've returned the following day with food and drinking water to support Rangers from Sai Yok National Park, Thong Pha Phum National Park and a Forest Protection Unit from the Royal Forestry Department. One ranger shows me a photo of a ferocious male elephant who has overturned a vehicle. They are identified by their ear patterns, this one has a hole in its ear. And now these experienced Rangers ... See more — with Ádám Molnár. 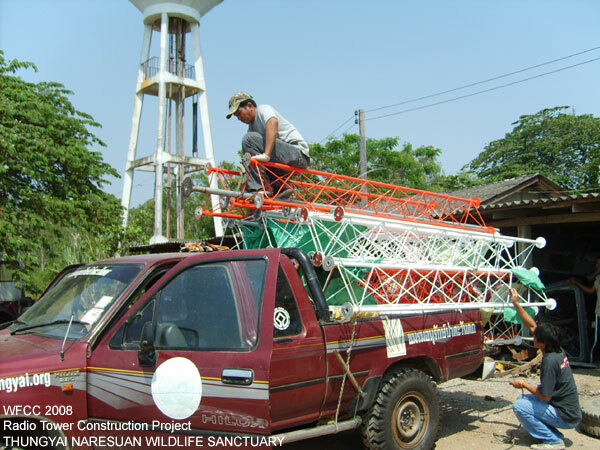 During 19 - 23 March, 2008, WFCC headed north to carry out the 180 feet Radio Tower onstruction Porject for the radio net controll station of Thungyai Naresuan wildlife sanctuary(east) at its head office in Tak province as requested by chief Sompong Thongseekhem, superintendent of the wildlife sanctuary due to its radio tower accidentally had collapsed down causing by the hit of one big tree branch that fell down and broke the northern tensioned cable of the 180 feet guy wire radio tower which not only damaged the tall radio tower itself but also its head office building both inside and out side as well. As this radio tower is a crucial structure of the radio net controll of the wildlife sanctuary at its head office that operates Thungyai east frequency of both receiving and transmeitting routine daily and urgent messages to its network radio stations that spread through the huge area of the great forest, hence, WFCC promptly listed the Radio Tower Construction Project for Thungyai east in its urgent project list. Then WFCC hurridly speed up all the processes and the construction mission from the examining and evaluating the project and all possible solutions, repairing the damage radio sections and producing the new noes, the redesign of the new guy wire radio tower, the acquistions of new antennas, cable, wire, turn buckets and all other needed construction material, tools, equipments, supplies, etc., to the final stage of the construction mission of the new radio tower and its system that started from late January 2008, till the urgently needed risk-taking porject completed on Marh 23, 2008, totalling effort and time input in this endeavour project is all about 60 days. 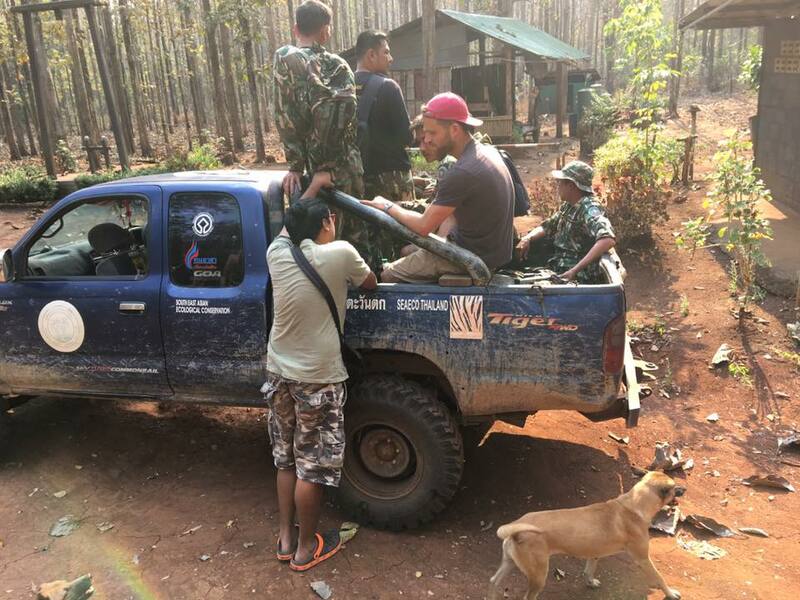 participating by officials and rangers of the wildlife sanctuary and WFCC that accompanying with Mr.David Kucera, Checz Republic, who also collaborated in this mission and redered the financial support to the patrolling of Thungyai rangers on behalf of The Checz Republic as proposed and organized by WFCC. Many hours of tough driving through 1,219 curves along the long and winding 'Road of Death' to Um Phang till the wildlife sanctuary, many burning fields set by hill tribe farmers as the primitive method of land preparation for the coming planting season that caused more global warming were spotted in the vast area along the raod sides. And after 4 hard and risky days of the endeavor project passed, finally the new 180 feet guy wire radio tower had successfully erected at its original spot with 2 new dipole antennas and coaxial cable installed which wired with more tensioned cables installed than before so that to strengthen the tall radio tower even more. 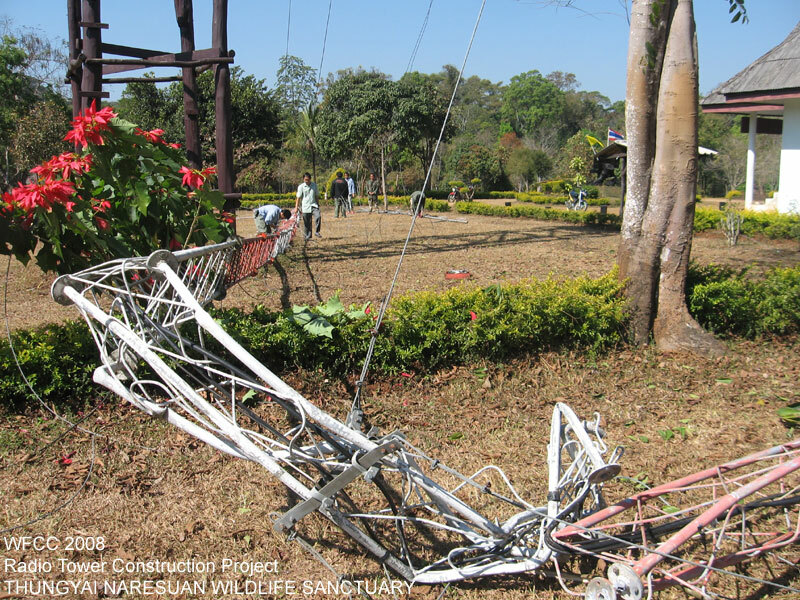 And when the radio net controller could retrive all the potentialities of his radio station, the center radio station of Thungyai Naresuan wildlife sanctaury(east), that efficiently responsed to all dimentions of the routine daily operations of this immense radio station which reinforce and back up all its rangers through its network stations that spread and cover the huge area of this pristine forest in their crucial patrolling to protect the priceless nature and wildlife of the great natural world heritage forest, then WFCC retreated back through the "Road of Death" to its stronghold fortification and ended up its another urgent and significant project, as the 1,600 Km. mission was totally completed. 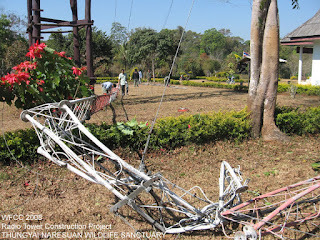 D530307: Radio Tower Construction Project for Thungyai East's HQ., a set on Flickr. 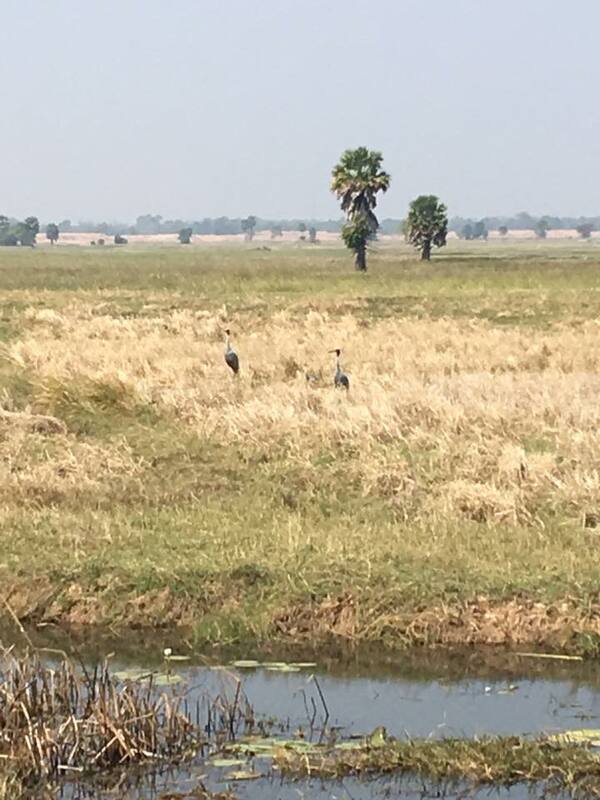 Several days ago, members of SEAECO and FWFCC arrived in Buriram Thailand at the Sanambin Reservoir Non-Hunting Area in hopes of getting a glimpse of the rare and endangered Eastern Sarus Crane (Grus Antigone). In just two days we've had quite an experience. — with Surin Binnan. 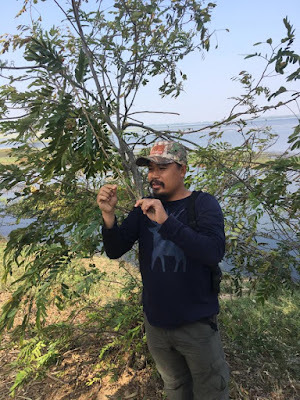 Our guide, expert, long-time wildlife researcher and good friend Hinpha Pranprai (Neung) spends his valuable time educating us on the history, habitats and habits of Thailand's Eastern Sarus Cranes. He's likely one of the foremost experts on these Cranes. We're hoping to get a chance to see some. 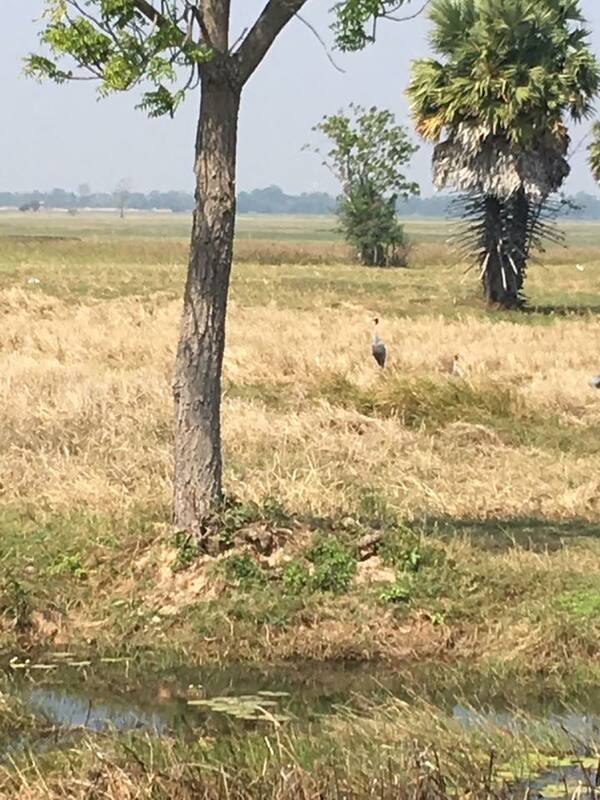 Neung is currently the head of production for CTV Bura Bha Co. Ltd. which will very shortly be airing a special production on the Sarus Crane. 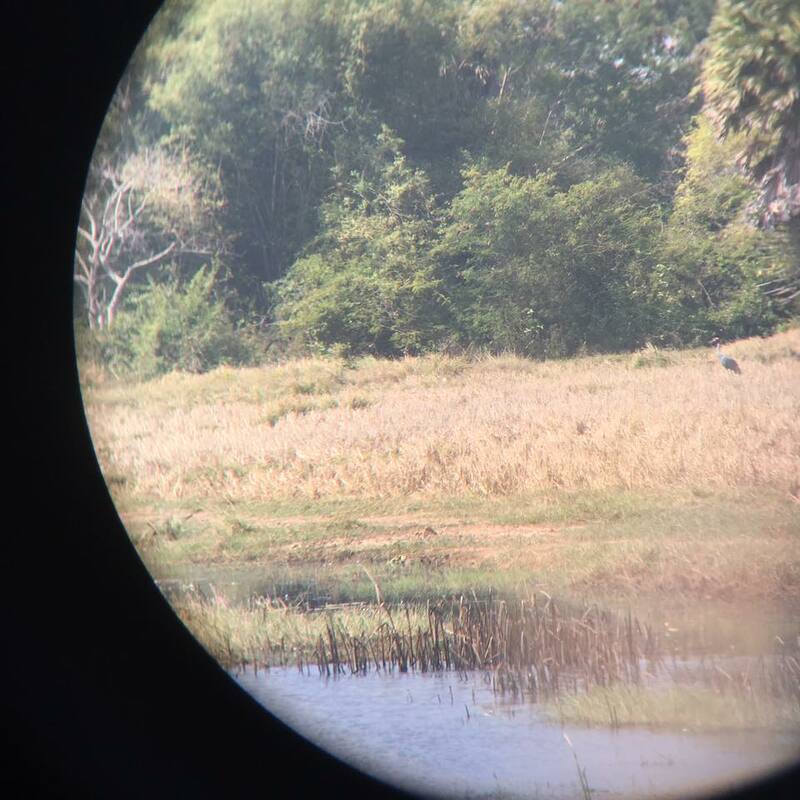 My first view of a pair of Sarus Cranes from a far-off tower...center right is the female and through binoculars we could see her in the process of building her nest and then practicing sitting on the nest which she will soon complete. Center left, the male actually danced for us. Once completed, she will install horizontally at the bottom of the nest, several hollow twigs which will make the nest float when the monsoons arrive. She will give birth in the coming months. They are extremely shy, have keen vision, (they can see up to 500 meters away), so even from a great distance any sudden movement can alarm them. Thailands' population in the wild stands at only 38 individual birds. As we approached the 2nd nest, I was well aware of my iPhone's limitations and by pure luck (and with very little skill, I might add )-: ), I managed to get a shot through the binoculars! You can see it's head against the green tree background. The Saras Crane is the tallest flying bird in the world with males growing up to nearly 6' tall. Like other cranes, they mate for life and in the event of one partner's death, the other will starve itself to death. This is likely one big factor for their ultimate demise in the wild. Predators include hawks and snakes, including the huge Burmese Python. 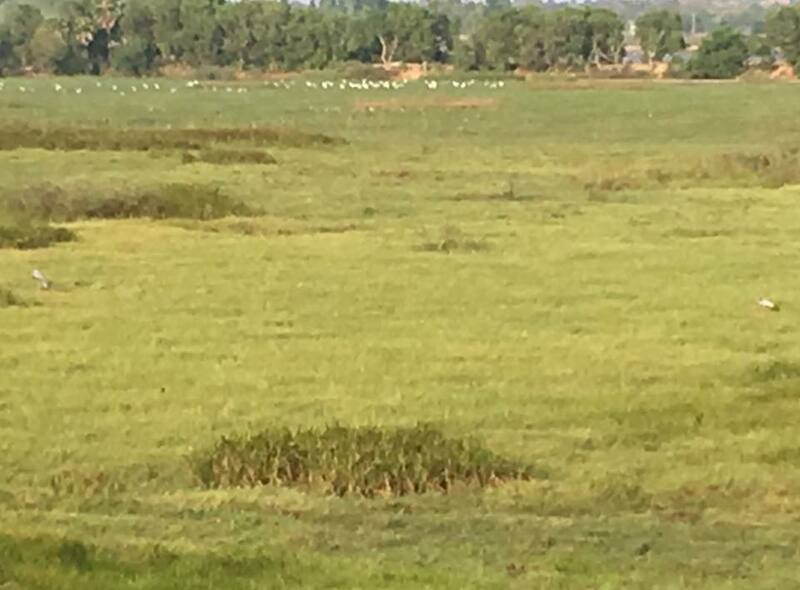 A small road surrounds the marshlands where these non migrating cranes live. If you stop, they immediately fly away, so I got these two lucky shots on a drive by... The male on the left and female on the right with a baby (barely visible) in between. May 12, 2010: At the head office of Thungyai Naresuan wildlife sanctuary, FWFCC performed the handover of The Solar System Construction Project that WFCC had carried out its construction & installation of the solar renewable energy system to every ranger station of the wildlife sanctuary during 2001-2006 which first started at Mae Kasa ranger station on December 24, 2001 just the day after the auspicious ritual ceremony of the finished reconstruction of The Hermit Shrine that WFCC designed and collaborated which hold high spiritual respects of all Thungyai officials and its rangers, and eventually ended up with the construction of 1 kilowatt solar system at Maharaja station in year 2006 on August 14. Mr.Roengchai Prayoonvej, director of The Administrative Office of The Protected Forest Region 3, presided over as a chairperson of the handover ceremony accompanied by Mr.Urb Choeng-sa-ard, diredector of wildlife division and DNP officials, and Miss Weraya Ochakul, superintendent of Thungyai Naresuan wildlife sanctuary, and its officials & rangers while David Butler and Binnan, FWFCC co-founders, represented on behalf of FWFCC. 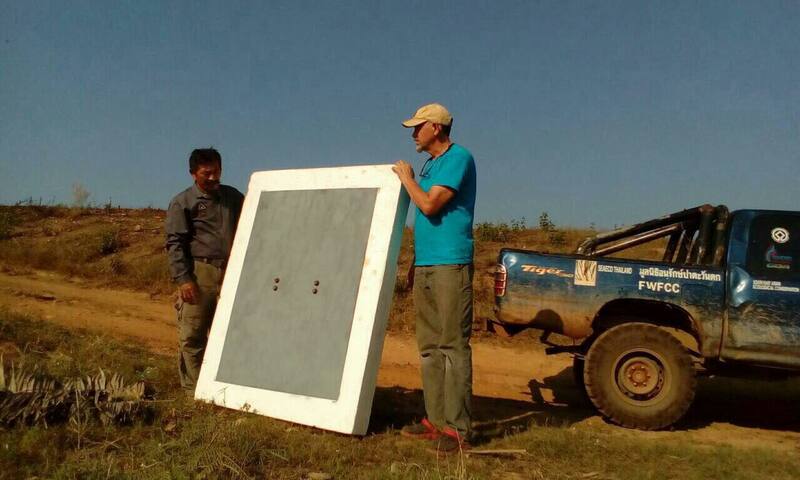 After the report stating of the Solar System Construction Project was done, the picture frame of the first tiger photo taken form the first Thungyai Tiger Research in year 2006 that driven by the organizing and supporting of WFCC which power by the renewable energy of this project was also handed to director Roengchai as a commemorative symbol of the handover of this project. The benefits & signicances of the huge investment in time & bugget consuming project which WFCC had input its effort & endeavor carrying out one of its forestry infra structure project, actually the mandatory mechanism of all forests, that needed a strong determination and enormous will power to overcome all obstacles and barriers of all kinds of travelling conditions in all seasons and the series of the monsoons through the great mountainous pristine forest, that turned transportation missions of needed tools, equipments, supplies and tons of the construction materials along with other ranger patrol supplies e.g., equipments, food, medicine etc., to be "The Impossible Missions"
Could be apparently noticed by the various dimensions in operational effectiveness that driven by the renewable solar energy of all ranger stations that spreaded through the huge area of this great forest, which is still functioning and driving all electrical equipments, especially all its radio stations and the Hermit, the central radio communicative station, the net controll of Thungyai that WFCC also started its construction in year 2003, till nowadays. 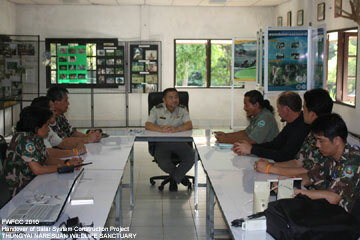 The main target of all our attempts in this endeavor project aiming & resulting in better effectiveness of the ranger patrol of the the wildlife sanctuary both in preventive & protective aspects beside responding the mandatory project for the preparation of the Tiger Research Project that successfully followed later on as planned. And the ultimate and utmost benefits of this project fall in better safeguarding the nature and wildlife of the world heritage forest for the sake of mankind and this fragile world. Copyright © 2015 SEAECO .Design By Blogger Templates & Websoham .